Dr Margaret Laird graduated with honours from the Dublin Dental University Hospital, Trinity College Dublin. Maggie, as she’s known, went on to undertake a House Officer post in Dublin Dental Hospital during which time she was awarded membership of Faculty of Dentistry by the Royal College of Surgeons in Ireland following completion of extensive postgraduate training and examinations. She then worked in an award winning private practice in Carlow, Ireland before moving to London to join The Wimbledon Dentist in 2014. Maggie enjoys continuing education and looks to bring her patients the highest standard of care in a relaxed, comfortable and friendly atmosphere. 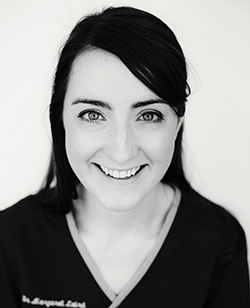 Maggie completed her Masters in Primary Dental Care in 2016 which focused on minimally invasive dentistry and evidence based dental treatment. She has a keen interest in all aspects of general and cosmetic dentistry. She enjoys creating natural, beautiful, healthy smiles using the latest techniques in the least invasive way possible. Known for her warm and friendly nature she is particularly popular with our nervous patients and patients who have not seen the dentist in a long time. With a relaxed and approachable manner, she is also excellent at creating a welcoming atmosphere for children to start their dental journey. Maggie is passionate about encouraging life-long oral health and loves to spend time with her patients teaching them how to look after their smiles. Maggie also provides non-surgical treatments to enhance the face, such as toxin and dermal fillers in a natural and subtle way. She was a recipient of a ''Highly Commended'' award at the prestigious International Facial Aesthetic Awards. IAAFA in 2017 in Mayfair. Outside of work, Maggie lives locally in Wimbledon with her husband and two young children. She enjoys spending her spare time in Wimbledon and Richmond Common.